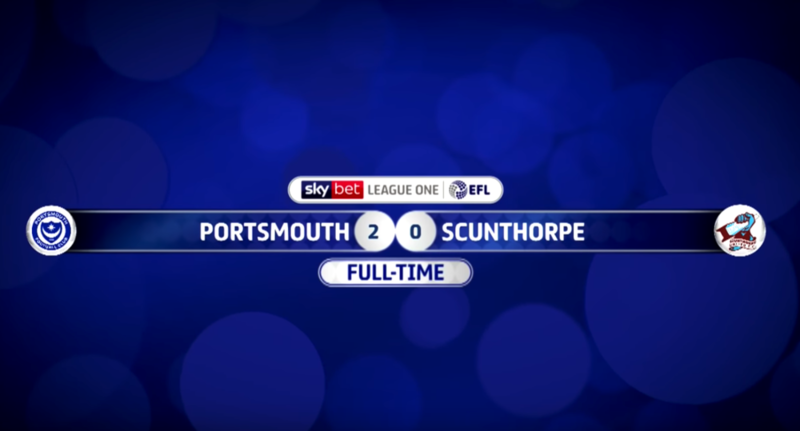 Pompey closed the gap on automatic promotion places with a confident 2-0 win against Scunthorpe at Fratton Park. It was a dominant display from the Blues for much of the match as players look to secure a starting place in this months trip to Wembley Stadium. After much battling, forward Omar Bogle finally scored in the second half to ease the crowds nerves. Scunthorpe didn’t look like causing too much trouble to the Pompey goal throughout, and late on in the match, winger Jamal Lowe secured all three points with Pompey’s second goal of the game. Kenny Jackett was pleased with the sides performance ahead of the cup final clash. He said: “It was a hard-earned result, but a deserved victory for us. We were in control during the first half, but just couldn’t find that final ball. “There were tough conditions with a bobbly pitch and the wind, but it’s like that all over the country and you have to find a way of adapting. “We had to persevere and it was frustrating at times, although the fans got behind the side very well yet again. “It was a day when we needed to stick at it and got the key first goal thanks to an excellent finish from Omar. He kept it low and gave the keeper no chance. “I was pleased with what we did after going in front – we stayed on top and scored another fine effort to run out comfortable winners. “There have been too many times this season when we’ve taken the lead and then sat back or rode our luck. “It’s something I’ve been talking to them a lot about – how we can handle the game better. It was a pleasing aspect.